Now that the regular season has wrapped, thought I'd check back in on Timmy. Lookin' pretty good. I'm still new to a lot of these stats. What do most defensemen get in 3rd party hosting usage %?
? what’s in the photo? .... something went wrong, I guess? Was an update of the Athletic's chart of teenagers in the AHL. 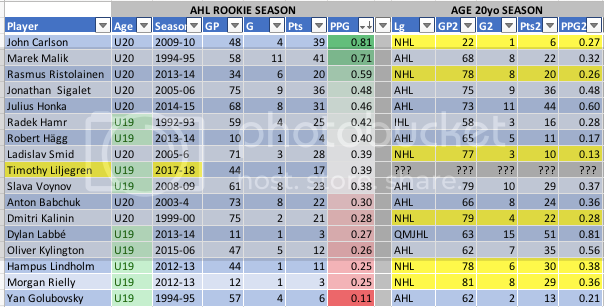 Timmy vs. the 16 other teenagers who've played at least 10 games in the AHL since 1994.